My name is Olivia L., and I am one of your happily veiled customers from Minnesota! :) I, and two very good friends, have read stories on your website about women who veil, and we were inspired to tell you OUR veiling story! We thought you might enjoy it. You see, last summer, my two friends and I began to (secretly) consider veiling for Mass. Little did we know that we were all being inspired by the EXACT same article on Facebook, which explained the significance and tradition of veiling in churches. During this time, we were preparing to leave on a pilgrimage to Rome, Switzerland, and Germany. Completely unbeknownst to each other, and after some thought and prayer, we ALL bought veils off of your web site and decided to begin veiling during our visits to the holy sites and churches across Europe. None of us consulted each other. It wasn’t until we began our pilgrimage that the three of us made the great discovery of the veiling "coincidence"! We were surprised at the simultaneous timing of our decisions and found it to be such a providential thing that we had a connection through your beautiful veils. We believe that it was all 'meant to be', and we wanted to just let you know how much your work has helped us embrace veiling out of reverence for Christ! 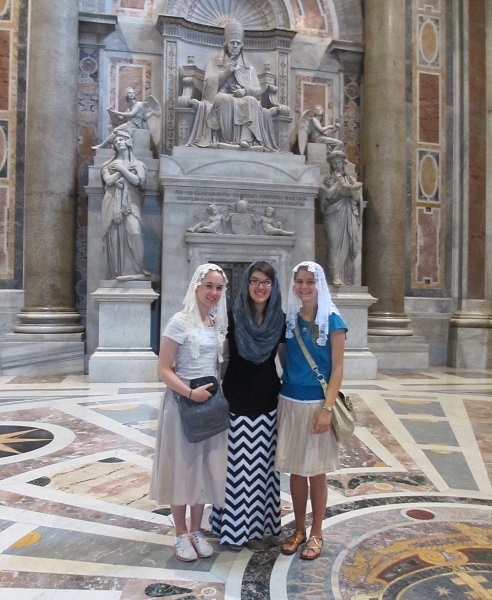 Inspired by your veils and our example, a few other young ladies on our trip also began veiling for Mass. It was such a wonderful thing to be able to encourage them and to give witness. We all love our veils so much and have greatly grown in our love and reverence for our Lord since the summer when we began. Thank you for using your talents for God’s glory by making mantillas! They are beautiful and will be lovingly used for years to come! Olivia L., Claire B., and Elizabeth F.